Release | What Is New With NeoFinder? 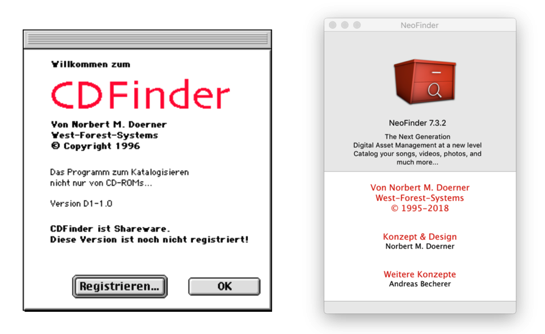 We are incredibly happy to present the 23 year Anniversary Version of NeoFinder! On this day, December 5, 1995, the very first lines of code were written for the CDFinder project. It was a very cold day, I still remember that. And today, 23 years later, we are happy to release the latest version 7.3.2 of NeoFinder, with some exciting new features and improvements. NeoFinder can now flip photos vertically and horizontally! 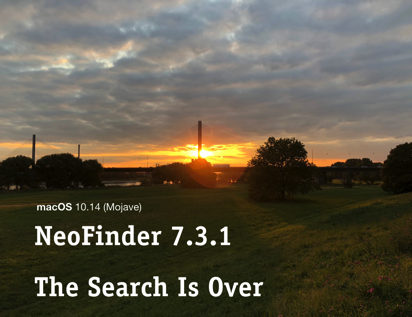 We are happy to announce the new NeoFinder 7.3.1, certified for macOS 10.14 Mojave! As Apple had added all kinds of undocumented changes and the AppleScript cage very late in the beta process, we were required to verify more or less any system call that NeoFinder makes (several thousand of them), and see if there are any unexpected results in macOS 10.14 that differ from what happened in previous versions. And we needed to write code to work with the new limitations that Apple has introduced. Nevertheless, this is a nice NeoFinder version to use in macOS 10.14, and it has a lot of cool new improvements as well. We are happy to announce the new NeoFinder 7.3! This is a massive update with more than 60 new features and improvements brings the long-awaited display filter, and the ability to catalog emails, as well as the cool Gallery View (and not only for macOS 10.14, but for Mac OS X 10.7 and newer!). NeoFinder now has a cool Gallery View! Not just in macOS 10.14, like Apples Finder, but in all Mac OS X and macOS versions since 10.7! Apple was able to approve and release the new NeoFinder iOS 1.9.1! We are happy to announce the new NeoFinder 7.2.1! Due to the speed improvements and fixes, this is a highly recommended update! We are happy to announce the new NeoFinder 7.2! The second large update for NeoFinder 7.x brings a lot of improvements and very cool new abilities, such as the XMP Preset Editor that will make handling large photo or video collections even easier. Find Duplicates is massively faster now! Really massively. Really! We are happy to announce the new NeoFinder 7.1.3 for High Sierra (macOS 10.13)! NeoFinder 7.1.3 is certified to run in the new macOS High Sierra (10.13)! We are happy to announce a new version of NeoFinder 7, which offers some great improvements, and bug fixes! It is recommended to update to this new version quickly. We are super excited to give you the first major update of NeoFinder 7.x! Not only does this new version massively improve integration into all of your workflows (the “Open with...” menu, or the ability to rotate photos, and a lot more), but this is also the long awaited Digital Asset Management tool for your Affinity Photo and Affinity Designer files! Only NeoFinder 7.1 can generate thumbnails for both Affinity formats, and even add ratings, keywords, descriptions, copyright information, and a lot more. Full support for the movie metadata written by AppleTV and programs such as Subler.app, including cover art, descriptions, actors, directors, producers, etc. In the display and the export, paths are no longer displayed with the old ":" separator, but with the newer "/"
NeoFinder 7.1 available today! Download the demo or buy a license or an upgrade now. NeoFinder iOS 1.8 available today! Apple has allowed us to release the new NeoFinder iOS 1.8! Due to the changes made by Dropbox, this new version is required it you wish to keep using Dropbox after June 1, 2017. After the unbelievably successful release of NeoFinder 7.0, we have received an incredible amount of feedback, and we are very happy to give you the first of them already in a brand new version! NeoFinder 6.4 is here! Now in 64-Bit! We are incredibly happy and proud to present the next big version of NeoFinder to you! It is much faster, thanks to supporting 64-bit memory addressing, but also due to some amazing optimizations under the hood! It also supports the new Tags in Mavericks, and the new Maps.app from Apple. NeoFinder is now a 64bit application. This allows for a lot of more memory to be used to deal with large catalog databases! NeoFinder can now Find Duplicates in your database! The Movie Contact Sheet also works for any arbitrary movie file you have selected in the Finder, using the NeoFinder Services menu! NeoFinder now catalogs Adobe XMP metadata, like keywords and descriptions, for movie files! 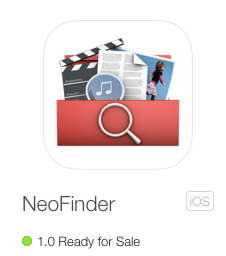 The new NeoFinder Global QuickFind gives NeoFinder a place right in your menu bar, near the Spotlight search field! NeoFinder can now import Cache-A catalog XML files! NeoFinder 6.2.1 now certified for Mavericks! NeoFinder 6.2.1 has been tested and works fine in the new Mac OS X 10.9, aka Mavericks. Of course, as always, we suggest to wait until at least 10.9.2 before updating productive systems to the new Mac OS X version. NeoFinder 6.2.1 for Gatekeeper released! That new security feature of Mac OS X 10.7 and 10.8 is now supported by NeoFinder! This special issue of the proven code in NeoFinder 6.2.1 contains a digital signature that makes it more trustworthy for Apple. NeoFinder 6.2.1 for GateKeeper is only intended for Mac OS X 10.7 or newer! If you are using Mac OS X 10.5 or 10.6, you can keep your existing NeoFinder 6.2.1. This version not only brings a few new features, but also some important fixes and improvements, so updating is highly recommended! 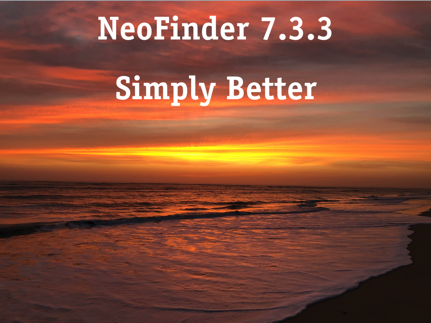 NeoFinder 6.2.1 is a free update for all NeoFinder customers. We are very excited about this brand new version of NeoFinder! It brings some very amazing new abilities, such as the new color labels, but it also fixes a large number of issues, and generally feels a lot better. Give it a try! You can now change the font size of all views in NeoFinder (in the View Settings!)! NeoFinder now remembers the view settings for each catalog! Added a context menu for "Search These Items", for selected catalog or catalog folders! NeoFinder 6.2 is a free update for all NeoFinder customers.